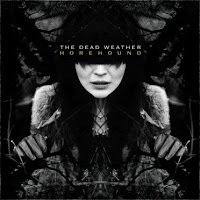 Atlas and the Anchor: The Dead Weather - "Horehound"
The Dead Weather - "Horehound"
Jack White from The White Stripes and The Raconteurs is back with his new project, The Dead Weather. Jack puts down his guitar and sits in on the drums, returning to his pre-Whites Stripes instrument. He played drums in the early 90’s in the Detroit area southern-punk band, Goober & The Peas. The Dead Weather also includes Jack Lawrence (Raconteurs) on bass, Dean Fertita (Queens Of The Stone Age) on guitar and organ, with Alison Mosshart of The Kills on vocals with all members contributing to the songwriting. With Horehound, Jack continues to add to his impressive blues-rock resume, this time venturing into darker, heavier and jammier territories. Horehound opens with the reverb-rich, rubbery blues riff on “60 Feet Tall” and includes not one but two feedback-fueled, blistering guitar solos with Alison sounding like a possessed PJ Harvey. On the gritty “Hang You From The Heavens”, Alison sings “I like to grab you by the hair, and hang you up from the heavens” with a deceptive sexiness, over top of a huge, steady beat and a fuzzy bass line. The surprisingly funky “I Cut Like A Buffalo” struts, with thick organs, a Reggae influence and duel vocals between Jack and Alison, standing out as one of the album’s best tracks. The Mosshart-penned “So Far From Your Weapon” is brooding, with call and response vocals and a driving drum beat. The first single, “Treat Me Like Your Mother”, is explosive with swaggering vocal duel, a hip-hop inspired callout near the end of the song and a lock-step groove. Their cover of Bob Dylan’s “New Pony” is heavy as lead and loud, with a snarling attitude, making the song their own. “Bone House” boasts a lyrical bravado (“I always get the things I want”) that matches the music with its cymbal-heavy drumming and surging synths. The haunting keyboards and jungle-thick bass line on “No Hassle Night” lends to the album’s overall sinister and grimey atmosphere. And finally, Jack White picks up the guitar for the acoustic, “Will There Be Enough Water?” a spooky, more traditional blues jam with pretty piano, a plodding beat and prickly guitar runs to end the album. CIV - "The Complete Discography"
The Rural Alberta Advantage - "Hometowns"
Therefore I Am - "The Sound of Human Lives"
Contest: Jeff Buckley - "Grace Around The World"